Who'd have thunkit... five years ago when I started this blog, I wasn't sure I'd be able to keep it regularly updated for five weeks, let along five years. 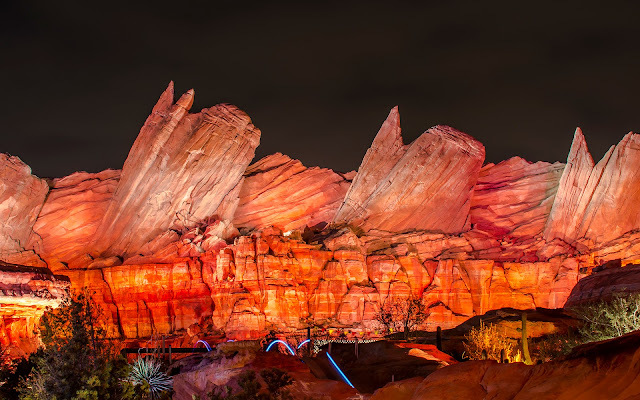 At the time, I merely felt inspired to combined two of my passions--photography and Disney--into a public forum that I could use to share my own love of the Happiest Place(s) on Earth with others who may not be so fortunate as I to be able to visit regularly. 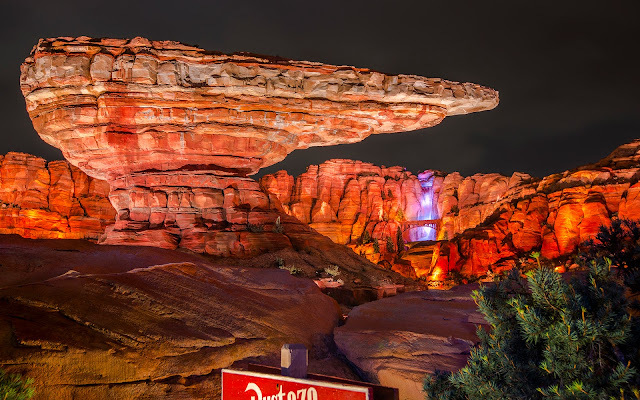 The opening of Cars Land and Buena Vista Street--two exquisite and extravagant changes at the Disneyland Resort--spurred me to make an idea into a reality, and five years later, I've somehow managed to maintain my "picture a day" (and often more than one picture each day) trend. The most dramatic entrance in all of Disney California Adventure remains the archway entry to Cars Land. 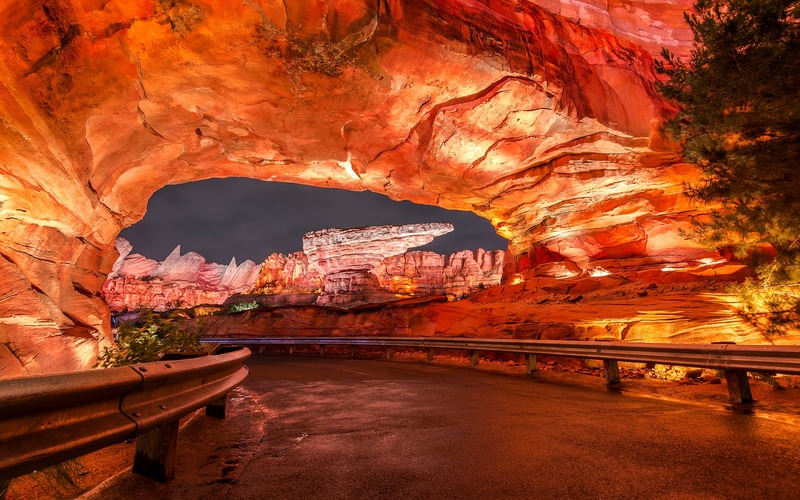 In the time that this blog has been running, I've accomplished a lot of Disney bucket list items that seemed like far stretches at the time. I've been able to explore the wonder that is Tokyo Disney Sea (twice!) --something I've always wanted to see in person. I've improved my own photography level to a state where I feel like I can at least occasionally approach that of some of my Disney photographer role models. I've also been able to visit every Disney theme park in the world--something that seemed impossible anytime soon while I was in my mid twenties. With those travels, I've been able to build this blog into what I think is a pretty good database of photos of Disney theme parks all around the world--one of the few on the interwebz that can claim such a collection. So certainly, these past five years have brought a lot of highlights for me personally, and I am extremely thankful for all of them. Willy's Butte and lovely Firewall Falls in the background. I'm also extremely thankful for the comments (both online and in person) that people provide, the appreciation expressed, and the compliments lavished (I think often undeservingly, but I still am grateful). My aim with this blog has always to bring a bit of magic to the viewer. So if it inspires warm memories or some sort of joy, then I've done my job. Any other recognition is just a bonus. The Cadillac Range are whimsical and monumental at the same time. 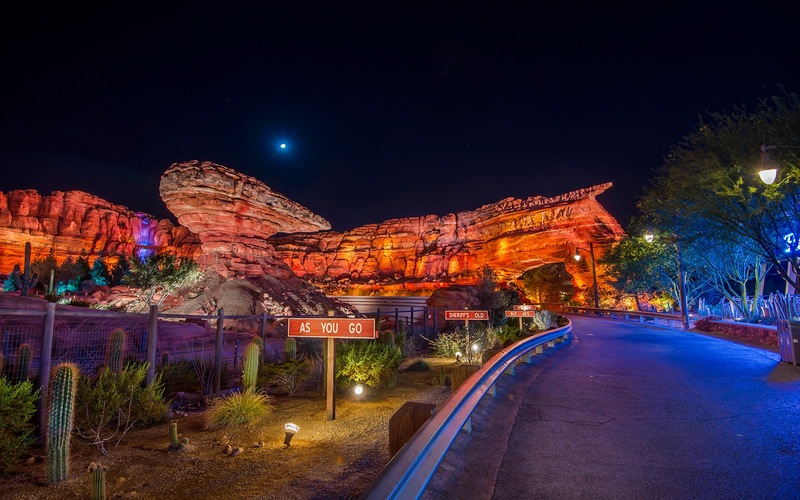 So on this, the fifth anniversary of Disney Photoblography, I'm taking back to the beginning, where the blog began... with Cars Land. In all its grandeur. It's been a fun five years, and I'm not planning on stopping this anytime soon. 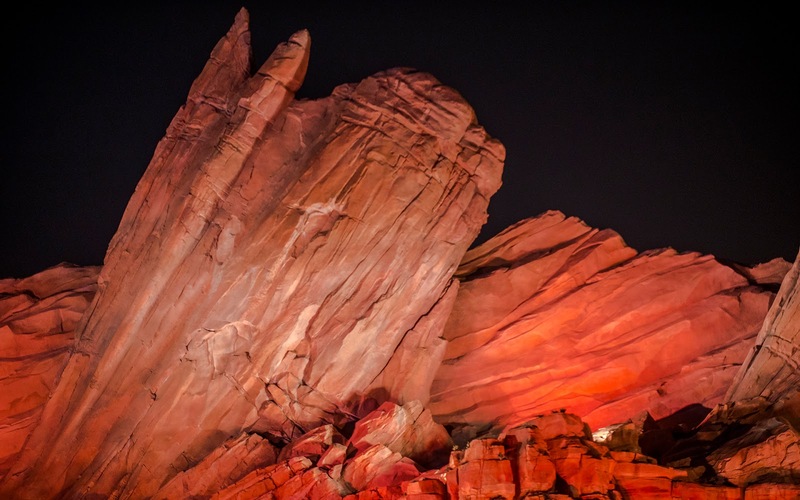 The stillness of Cars Land at night is absolutely magical.